"Well I wondered. What's the worst thing I could say?" Guns is ranked 2nd best out of 6 albums by Quelle Chris on BestEverAlbums.com. The best album by Quelle Chris is Being You Is Great, I Wish I Could Be You More Often which is ranked number 23642 in the list of all-time albums with a total rank score of 42. Members who like this album also like: 4:44 by Jay-Z, Kids See Ghosts by Kids See Ghosts and Weezer (The Black Album) by Weezer. Related links: top tracks by Quelle Christop tracks of the 2010s, top tracks of 2019. Showing latest 5 ratings for this album. | Show all 24 ratings for this album. At the end of his new album, Quelle Chris wonders how he will be remembered: "Twenty disks on the counter / Always presented as a new artist every other time" ("Wyrm"). The rapper from Detroit, but now based in Brooklyn, is not basically wrong. Despite a series of frankly successful albums (the excellent "Being You Is Great ..." in 2017, "Everything's Fine" with his fiancée Jean Grae last year), the name Quelle What is still largely unknown, in outside the initiates. Neither really "classic" nor trendy, his approach of the medium rap yet makes sparks again on "Guns". As its title suggests, this new album focuses more specifically on the issue of weapons in the United States. On the damage it causes - "Sunday Mass", for example, listing a series of recent mass killings ("Devin Kelley blasted off in the Baptist church / Motivation unknown, but his shot was straight "). Or about the repercussions they may have on the African-American community, whether it is the target ("Color of the Day"), or whether the violence is against them ("Who's next?" sister, you? / Hey kids, get rid of your guns before it's too late "on "Box of Wheaties"). Without ever falling into the preaching, but sliding on the contrary an ironic humor ("Straight Shot"), on productions as eclectic as exciting, reminiscent of both Wu-Tang and Native Tongues. A frank success, one more. 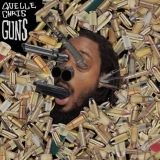 Sincerely, the lyrics and jazz productions of this album are surely some of Chris' best, yes, I think "Guns" is the best album of Quelle Chris. Best track: "Straight Shot (feat. Cavalier, Bilal Salaam, Eldar Djangirov & James Acaster)"